Prior to Lauren joining the Highland family in July 2016 she interned at a Mennonite Church in Pasadena, CA; served as Director of Worship at The Riverside Church in New York City; Director of Caldwell Chapel at Louisville Presbyterian Seminary, and Pastor of Lynnhurst United Church of Christ in Louisville, KY.
With degrees from Samford University, Fuller Theological Seminary, and graduate coursework at Yale Divinity School, Lauren believes that when the Church engages culture prophetically, compassionately, and relevantly, it will be a place where our lives are transformed. So leading the Young Adults for Lauren is about offering space for Millennials to push back on authority while engaging the necessity of organic and sincere community. While paying close attention to the intersections of spirituality, politics, and culture, Lauren also works with our three mission teams—community, global, and justice—to help congregants put belief and love into action. 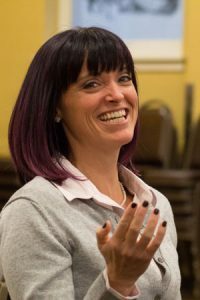 Ordained in the United Church of Christ, Lauren recently served on a local denominational oversight committee, as well as the board of Uspiritus, a residential treatment facility for children victimized by trauma. She currently serves on the board of Planned Parenthood of Indiana and Kentucky and travels with church folk to Frankfort as often as possible to rally and lobby. In her free-time she dreams of owning a free-of-charge yoga studio that serves fair-trade, organic tea by day and (red) wine (only) by night. She and her husband Tyler have three children. She blogs here.